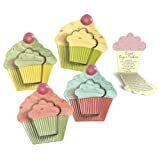 A selection of cute cupcake themed accessories and gifts for the kitchen and home. These make sweet treats that can be enjoyed by you and any visiting guests coming to the house. Kitchens can definitely be very fun spaces these days as well as highly practical and functional. A cute cupcake theme can make for a real sweet treat of a room that you might just never want to leave. You don't have to be much of a skilled baker yourself to appreciate the lure of this darling little miniature cake since they pretty much appeal to anyone who has ever delighted in that heavenly mix of soft, moist sponge topped with a rich and creamy frosting. Your sweetly accessorized room could be such a hit with your guests. If you know someone who is a collector of cute and especially kitschy items and home decor, you will find some excellent suggestions on this page because I am a big cupcake fan myself. And if you're buying for yourself, you'll get some good ideas and inspiration on creating a cute, colorful and fun room that you can delight in being in day after day. Please Note: This post contains affiliate links for which I may be compensated. 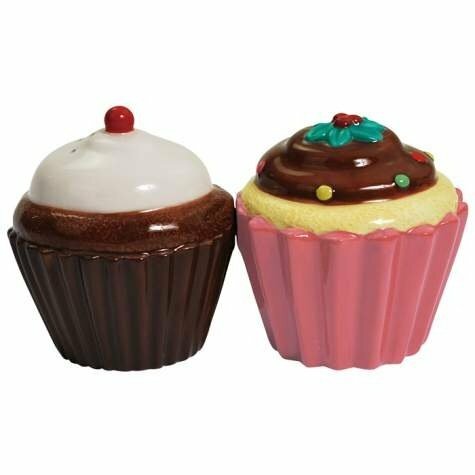 These ceramic cupcake shaped dessert plates are glossy and come in a range of cute and vibrant colors which could look really great left out on display in a kitchen. Although not flat, you could mount them in a cute arrangement on the wall with the right hanging fixtures to create a focal point for your room, prop them on a shelf with a lip so they don't fall over or put them out with covered candies and treats on your table. I'd reserve these plates for my very best guests. You can get a refreshing 7 piece cupcake decorated kitchen set (not pictured) in cute shades of blue with hints of pink and brown. It's a gorgeous little set to match up with a themed kitchen and it would go down very well as a gift too. The set consists of three kitchen towels, a dish cloth, two pot holders and an oven mitt. The nice thing is how it all co-ordinates and the colors are ones which are often found with the mini confectionery cakes too. If you dine in your kitchen or you have a shelf or table for your trinkets, this is a cute looking set of cupcake items to get. A sweet little ceramic salt and pepper shaker. A matching little pair who remain together with their magnets until you divide them. Westland giftware have a really whimsical, pastel color ceramic snack jar (not pictured) which can be used just for display or to hold cookies and other small treats in style. In fact, if giving this as a gift, you could add on a package of cookies to fill it with too. 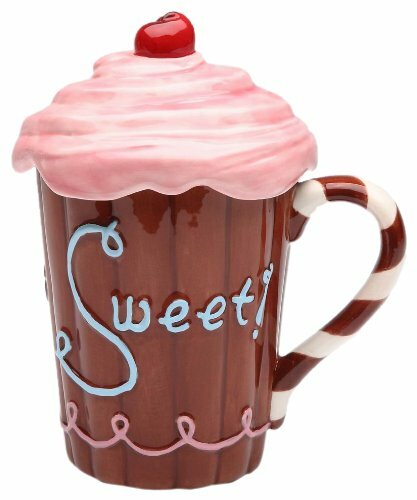 Sweet indeed is the look of this adorable mug which comes with a lid to help keep the contents warm until you're ready to drink it up. The design works so well with this and I love the pink frosting with the cherry on the top. I love this idea. If you have a piece of bare wall large enough (32 x 24 inches for the large cupcake) then you can fill it with a unique cupcake shaped wall decal sticker chalkboard - not pictured. It could make a fantastic show-piece for your cupcake kitchen and it is practical too because you can use it to jot down all the reminders you want. Never forget to buy milk and bread again! The chalking area is large since the the decal sticker is actually all in black - you can use colored chalks to color it in or you can make the most of the large surface by leaving it plain to write on. What is so good about this set is all the extras that you get with it too: the designs yummy, a candle, a cherry and tons of sprinkles to use with it. You can pop them on your walls wherever you like and they can all be drawn on with chalks. 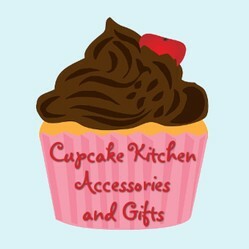 You can quickly create a themed kitchen by buying some cupcake themed wall decal stickers. There is a good choice of cupcake decals on Amazon, eBay and other stores online. Most modern wall stickers are removable and re-positionable. They are quick to apply - just make sure that your painted area of wall is clean and dry before you put the stickers up. Measure out roughly where you want the pieces to go before you put them up too. This will save any headaches. These cupcake wall stickers can be used to decorate a blank wall or painted cupboards even. Group them in a row, column or square OR have them dotted around your kitchen. Of course, an ideal accessory is a Cupcake Queen style apron (not shown) from Zazzle which can be personalized with any name - I'd love one of these to wear when I'm baking! Which yummy item will you choose? I have never thought of cupcake designs being collectibles. I went on a cake decorating course last year . I loved it ; and the first week was cupcakes. I learnt so much... how to fill them with jam, various types of icing them, using a icing bag, how o dome them with icing . It has completely changed how I do them. Thank you, Veronica. I love anything cupcake and they can really look sweet in the kitchen as accessories. I love the salt and pepper shakers. So pretty. These look good enough to eat ! Great ideas and ty for posting , Very useful to home- bakers such as myself. A sweet selection of cute cupcakes with ideal and yummy gift ideas and inspiration for adults and women in particular who adore these miniature treats. Giftware for the home too.